The new Dance Studios at Tring Park School for the Performing Arts, design by Burrell Foley Fischer, have been judged the Overall Winner at the Chilterns Buildings Design Awards 2013. The awards are organised by the Chilterns Conservation Board and the Chiltern Society to encourage the highest possible quality of building design and thus conserve and enhance the character and outstanding natural beauty of the Chiltern Hills. The building is the first phase of a three phase project for new, professional standard, performing arts facilities and comprises five new dance studios set into a landscape of Registered Parks and Gardens and within the curtilage of two Grade II* Listed Buildings. The new studios are designed to sit comfortably in a green part of the site, taking a soft approach to its architectural form to mask its bulk and scale. The wild meadow grass roof, lowered eaves and randomly spaced timber posts along its elevations are designed so the building will ultimately recede into its wooded setting. "The development of a handsomely shaped building which demonstrates changing rhythms; fits well within its garden setting and brings together function and beauty with calmness and serenity". Burrell Foley Fischer were invited to take part in a limited design competition for a new Assembly Hall / Chapel / Performance space within the grounds of Canford School, Dorset. Founded in 1923, the school stands in a magnificent 250-acre park. The river Stour forms a boundary and there are splendid formal gardens and playing fields. The oldest part of the buildings is a fine medieval hall (known as John of Gaunt's Kitchen); part of the present building is Georgian, the rest was designed by Sir Charles Barry in 1847, and is Listed Grade I. The judges commented: “hugely impressive process and presentation. Excellent styling and sympathy shown for both the existing buildings and the parkland setting. The vertical lines and the sense of light were pleasing to contemplate”. The project for Interchange Studios, completed in 2000, involved the construction of a new Weekend Arts College and the conversion of the former Hampstead Town Hall, a Listed Grade II building into a new headquarters for charities, voluntary organisations and the University of the Third Age whose activities are centred around the arts, training and people with disabilities. The building accommodates many of the organisations under the umbrella of Interchange Studios, providing offices, a library, function and meeting-room spaces, a performance hall seating 250 people, foyer spaces, and a café/bar for both visitors and occupants alike. The building is linked to a new extension by a glazed atrium art gallery space. The new extension is occupied by the Weekend Arts College, providing music, dance and drama for young people, including those with disabilities. The College comprises two new rehearsal studios, music practice and recording studios, and affiliated storage, changing rooms and office spaces. Twelve years later Interchange continues to thrive and has provided support to many people of all ages. Amongst those who have benefited from the venue include members of the street dance group, Diversity, winners of Britain's Got Talent in 2009, and Ms Dynamite who said "WAC was the foundation of the experience and expertise I needed to become the artist I am today". We have been commissioned to refurbish and remodel the main reception areas for the School of Arts at Birkbeck, University of London. The School of Arts occupies 39 – 47 Gordon Square, Listed Grade II, in Bloomsbury and wish to create a stylish, flexible space that provides a distinctive image for the School, including reception, exhibition and teaching spaces. Thomas Cubitt, then London’s best-known builder, developed Gordon Square in the 1820s. It is famous for its association with the Bloomsbury Group, a collective of intellectuals, writers and artists, including Virginia Woolf and E.M. Forster, who lived and worked around Bloomsbury in the first half of the 20th century. The economist John Maynard Keynes (1883–1946) lived at 46 Gordon Square, which is marked by a blue plaque. The same house was used by the Bloomsbury Group when the painter Vanessa Bell lived there before Keynes. The performing arts centre is a new theatre built for both teaching use and public performance, including dance, drama and music. 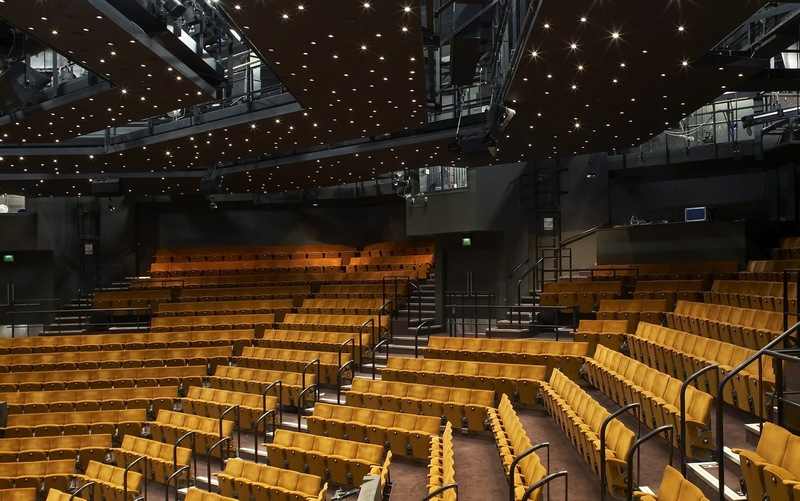 The auditorium, with a seating capacity of 340, is modelled on double cube proportions, creating a very adaptable space rising in three tiers to an exposed, trussed rafter roof. Staging can be arranged in a variety of layouts to suit the performance space required: from an open-end stage to a proscenium frame; and from a thrust stage to theatre-in-the-round. The seating can be electronically retracted to the rear wall to give a level floor surface throughout. Each of the staging configurations can be set up by three people in about 45 minutes. The building is sited within the grounds of an Edwardian Mansion, which accommodates the main part of the school, in an Area of Outstanding Natural Beauty. It rests calmly behind a screen of mature oak trees, through which the lively foyer areas can be seen from the direction of approach. Awards for the building include The Farnham Society Amenity Award 2001, The Royal Fine Art Commission/Sky TV ‘Building of the Year Award’ in the Education Category 2001, The Timber Industry Award 2001, The Waverley Design Award 2001 and a Civic Trust Award 2003. An original feasibility study and development plan was undertaken by BFF in 1996 to establish a long-term strategy for the development of the School’s facilities. The scope of the study included the acquisition of Technology College Status; a new library; IT and private study facilities; new teaching spaces, including classrooms, science labs and technology workshops; a new Sixth-Form Centre; improved sports, drama and performance facilities; improved access, circulation and playground facilities; and the introduction of full disabled access throughout the school. In 1998, following the acquisition of Technology College Status, a new IT classroom was constructed and informal IT access within the existing school library on a new mezzanine level was introduced. In early 2003 BFF was commissioned to undertake the detailed design of the first phase of the long-term development plan (the new Sixth-Form Centre) and to obtain planning permission for this and the second phase, the creation of a new school entrance, reception and administration facilities. Work on the third phase of the project, the development of the existing Victorian building which houses the Technology Block, was completed in 2007 in a two-storey extension to the main building providing new workshops for vehicle maintenance, painting and decorating, etc. The most recent phase is a new build extension which includes specialist ICT and general purpose classrooms, and a professional catering kitchen teaching space. Owing to the nature of the project, all of the works have been planned and sequenced in order to minimise disruption to teaching and to avoid the need to decant pupils to temporary classrooms or alternative sites. Park Studios, five new dance studios designed by Burrell Foley Fischer, were officially opened today by The Lord Lieutenant of Hertfordshire, the Countess of Verulam. Three Burrell Foley Fischer projects have been shortlisted for the 2011 Royal Institute of Chartered Surveyors (RICS) Awards. The Kavli Royal Society International Centre at Chicheley Hall, in the Conservation category, The Crucible Theatre Sheffield, in the Community Benefit category, and new Dance Studios for the Tring Park School for the Performing Arts in the Sustainability category. The Kavli Royal Society International Centre at Chicheley Hall has been shortlisted in the South Eastern Region for a Conservation Award. 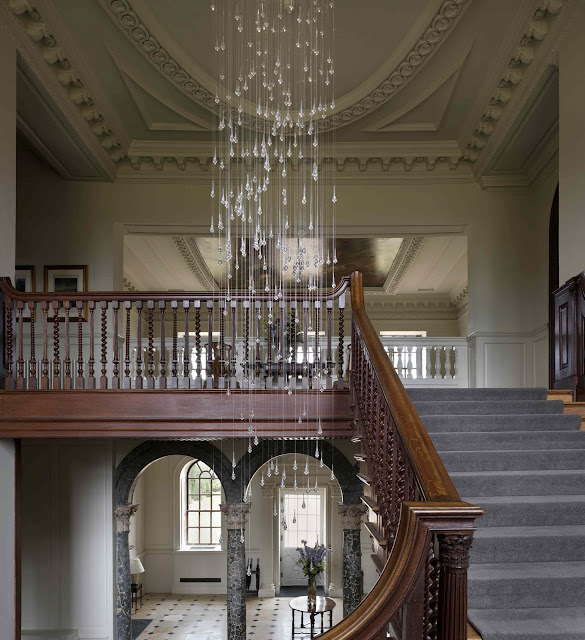 The refurbishment and remodelling of one of the country’s finest early Georgian Country House Estates, in Buckinghamshire, for the Royal Society. The Centre runs a programme of major scientific meetings and policy forums at national and international level. The Main Hall (Listed Grade 1) and the wings (Listed Grade II*) have been refurbished and remodelled to provide lecture rooms, meeting and seminar spaces, reception and dining rooms, together with 50 ensuite bedrooms. 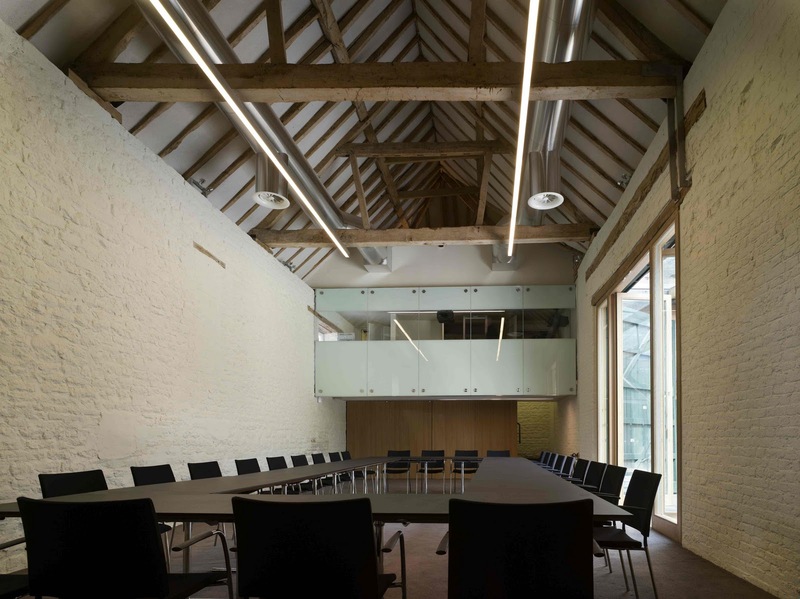 The Coach House (Listed Grade II) has been converted to provide lecture theatres, meeting room, conference office and a registration and break out area in a new glazed enclosure. The Crucible Theatre Sheffield has been shortlisted in the Yorkshire and Humberside Region for a Community Benefit Award. The refurbishment and remodelling has revived and restored this Grade II Listed theatre. The front of house areas have been extended providing a new and welcoming frontage onto Tudor Square, new function rooms and allowing the box office to be moved from the bowels of the building closer to the main entrance. The integrity of the original design has been reinstated and extended and the auditoria and back of house areas have been refurbished. The hosting of the Annual World Snooker Championships at the Crucible has meant that its “community” is far wider than just Sheffield; it holds a special place in the affections of people across the country and internationally. The development was phased to allow the championships to be held each spring, ensuring that the international showcase for Sheffield continued uninterrupted. New Dance Studios at Tring Park School for the Performing Arts have been shortlisted in the East of England Region for a Sustainability Award. The first phase of a three phase project for new, professional standard, performing arts facilities comprises five new dance studios set into a landscape of Registered Parks and Gardens and within the curtilage of two Grade II* Listed Buildings at Tring Park School for the Performing Arts. The building is constructed using an innovative and sustainable, prefabricated, structural timber wall and roof panel system, providing very high standards of thermal and acoustic insulation. The natural timber finishes, low energy use, good internal volumes and naturally illuminated interiors provide an inspiring environment for the teaching and practice of dance. Burrell Foley Fischer LLP have completed designs for a new Academic building at Kingham Hill School in Oxfordshire. The new building will provide new science laboratories, classrooms, a new library and small lecture theatre. It will sit on a prominent wooded site between two fine ranges of Cotswold Stone Buildings. The School's brief was for a quality building which sits comfortably within its Cotswold setting. Dame Tamsyn Imison, former Headteacher at Hampstead School, was the guest of honour at the official opening of the building named after her and designed by Burrell Foley Fischer LLP. An original feasibility study and development plan was undertaken by the Practice in 1996 to establish a long-term strategy for the development of the School’s facilities, with early phases including a new Sixth-form Centre. The latest phase is a new build extension which includes specialist ICT and general purpose classrooms, and a professional catering kitchen teaching space. A footbridge connecting the new building to the existing building at first floor level is also provided to integrate the new building into the existing Technology Block. This also means that the first floor areas in the existing building are accessible via the lift in the new building. The materials for the external elevations of the building follow the language established in the previous phases, ie. terne coated stainless steel sheet and semi glazed black bricks, combined with large areas of glass to provide light, views and ventilation to the interior of the new building. The Tring Park School for the Performing Arts have moved into their new building housing five Dance Studios, designed by Burrell Foley Fischer LLP. The School sits in an Area of Outstanding Natural Beauty and occupies a Listed Grade II* former home of the Rothschild family at Tring Park. The grounds are listed Grade II and the Clock House which forms the front to the former stable block is also Listed Grade II*. The School has an aspiration to be one of the leading performing arts schools in the country. The new Dance Studio building has been designed to nestle within its heavily wooded landscape setting with randomly spaced Red Cedar perimeter posts to echo the surrounding tree trunks. The dense wildflower meadow grass roofs reference the surrounding tree canopies and undulating landscape. The studio rooflights and high level windows create visual connection with the surrounding landscape and abundant day lighting for the dancers. The Dance Studios are the first building in a three phase BFF masterplan which has Planning Permission, with later phases including a new Art Department and a new 280 seat theatre for Dance and Music theatre. Mark Foley speaks at Designing School Theatres, the annual conference of The Theatres Trust. Mark Foley spoke at Design School Theatres, the annual conference of the Theatres Trust held in April 2010 in Leeds. Mark outlined his experience of designing performing arts spaces for schools (including The Menuhin Hall, at the Yehudi Menuhin School and The Performing Arts Centre at Frensham Heights School) and the issues that arose in his drafting of the unpublished Building Bulletin 97 for the DFES “Facilities for Sports and the Performing Arts”. Also participating was Margaret Rutland, Former Headmistress of The Godolphin and Latymer School, Hammersmith, London who talked about the recently completed Bishop Centre, a multi-purpose performance space in a redundant Butterworth Church, designed by Burrell Foley Fischer LLP. The recently published Theatres Trust Conference 10 report, Designing School Theatres addresses the differences in school theatre design in maintained and independent schools, and the importance of performing arts teachers’ involvement in the design process and is available to download from their website.